To avoid total propagation of fire inside a building, a correct partition must be made in compliance with the standard in order to get fire sections. Installation ducts are a very delicate element between section changes. We must pay special attention to plastic pipes since they melt in the first stages of a fire, leaving a gap where smoke and flames can go through, resulting into a useless building sectorization. We usually find this situation on a garage ceiling and its plastic pipe installation: if a vehicle burns, smoke would spread, plastic pipes would melt and fall over the floor and flames would immediately run through the downspouts to the upper house. According the DB-SI, these pipes must provide a blocking element that closes the gap in case of fire with a dimension equal to, or greater than 50 cm2 (equal to, or greater than 80 mm diameter). Smaller pipes must also be partitioned if they are lower than 2 m high and their diameters sum is more than 50 cm2. 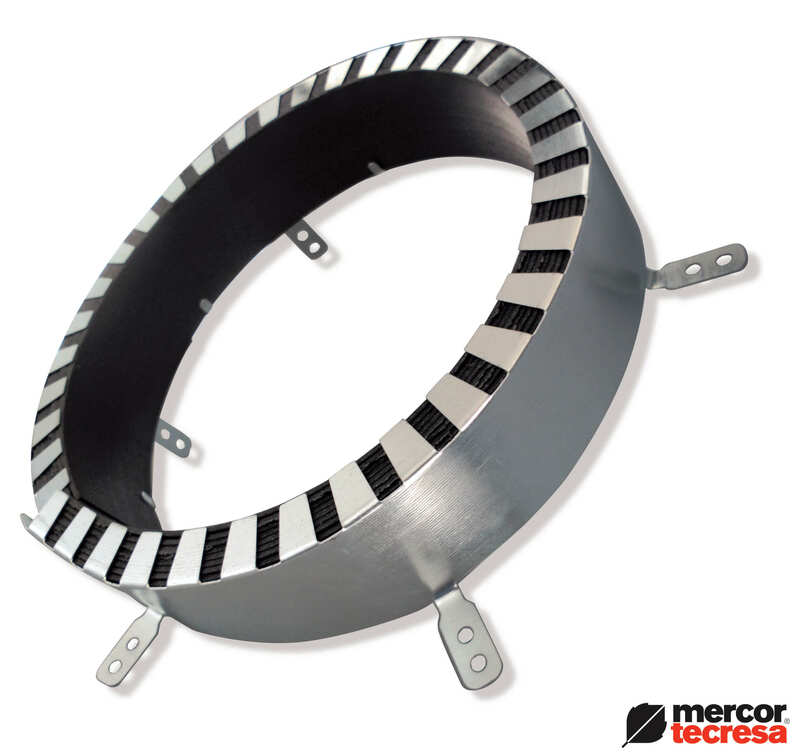 mercor tecresa® Technical Department has developed several systems to get a solution to this plastic pipe partition. Our last development has been the new Tecsel Collar®. This product is made up by a metallic casing of 0,7 mm thick of galvanised steel or 0,5 mm of stainless steel with attached intumescent graphite sheet of 2,5 mm thick and 30 or 60 mm wide, depending on the collar diameter. Under the influence of fire, the expandable graphite strip swells and blocks the opening in the plastic pipe, which prevents fire or smoke spreading across various fire sections. 1.- The test confirms the Collar can be used on almost every thermoplastic pipe type: PVC-U, PVC-C, PE-HD, PE, ABS, SAN + PVC, PP-R, etc. It is crucial to verify this key issue when choosing an intumescent collar, since some products in the market are just tested for PVC and they are not intended for other plastic type, like PP or PP-R acoustic isolation. 2.- Easy and quick installation. The product is ready to use for each diameter. We do not need to measure and cut bands for each downspout, as we need to do with other similar products available in the market nowadays. 3.- Valid test on slabs and also on rigid and flexible partition walls. This is a key matter too. We have to verify the chosen product runs on flexible plasterboards, since many collars are only tested over rigid slabs and not over the flexible ones. 4.- Tested for pipe groups. Increasingly often, some pipes go together through a unique fire section change. Few available products in the market may currently comply with this specification. 5.- Tested over slabs, placed at inclined angles. Sometimes, plastic pipes go through the partitioning element obliquely. Our Tecsel Collar® has been tested and solves this problem without any additional structure, as we can see in similar marketed products. 6.- It is also tested on elbows that do not allow the collar installation. This is a very common problem mainly on ground floor to garage or premises downspouts, where elbows are immediately set up to the slab, making impossible any space for collar installation and requiring additional structures for it, which increase time and economic resources. Refer to the product data sheet or contact us and we will be happy to answer your questions.